Have you’ve ever gone to a session, sat cautiously in the circle only to cradle your instrument in your lap and try to figure out how the hell to pack it up before anyone notices? If so, no need to worry, The Alchemist‘s weekly Irish session is nothing like that. 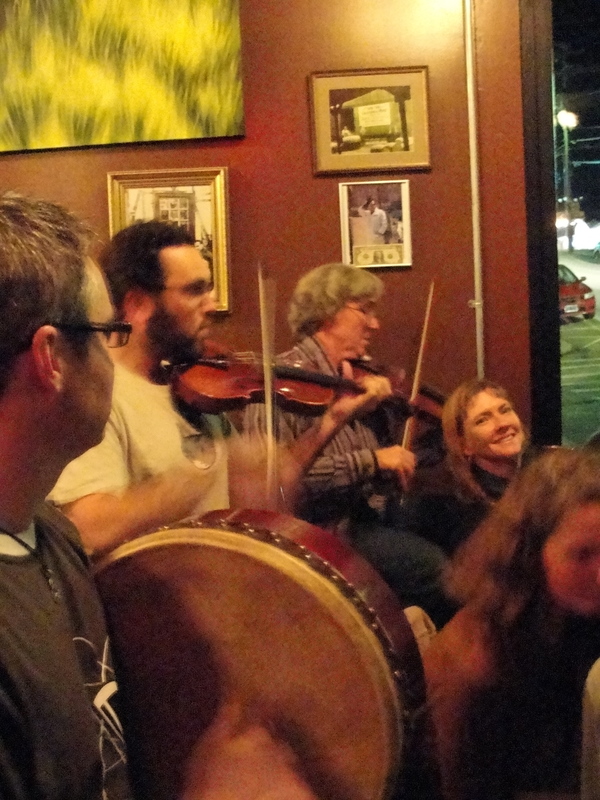 Although the tunes are fast and the players have chops, the group is very welcoming, which can sometimes be unheard of at an Irish session. Multi-instrumentalist Juls Loose, started this session about 4-5 months ago with the goal of creating an atmosphere for experienced and inexperienced session musicians to feel comfortable playing. Though there is hardly any lag time between tunes, all musicians are invited to start a tuneset and join in on what they know. The bar is small and the playing space is extremely tight but the atmosphere is festive, the beer is yummy and the tunes flow like champagne out of a newly opened bottle. Because of the size of the space the noise level gets up there so there is a microphone that sits in middle of the circle feeding the music into the house sound system. The session takes place every Sunday from 4-7pm and is slated to be a permanent happening throughout the winter and beyond. Juls has a website where he sells all sorts of cool stuff but also updates whether or not the session is going on. So if you’re going to make the trek be sure to check his website before you go for the latest update. www.jloose.com.